Studying is harder the older you get. This is obvious, but still a fact of life, and happens to be a huge part of my life. And it’s not because our brains get older, it’s because our brains get busier. When I was 18, I started a Diploma in Horticulture. I had a busy social life, and had a weekend job, but I still cracked distinctions in most subjects. That’s because I was staying with my parents still. I didn’t have to worry about cooking or cleaning or ironing or washing clothes. Then came the next qualification, a Theology Degree when I was 30. This time I was married, and living 17 hours away from my family in Cape Town. If I didn’t do it, or remind the person who was supposed to be doing it, it didn’t get done. I stayed up until 12am most days. I put on weight due to the nightly 11pm visits to the 7/11. But I still got several distinctions. Now, my school is paying for me to do a year Post Graduate Certificate in Education, and this is when the rubber hits the fan. Now I’m 40, divorced, busy editing my first novel, busy writing my second novel, planning a teaching syllabus for three grades, and trying to get my daughter through Grade Four. This is why I forget to write my blog on time; a pressing matter of two assignments to hand in this week. And it doesn’t help that the institution I’m studying at do not seem to be very good at admin. And marking. And getting the address of the exam venues right. And all sorts of other things. So on top of all the usual stress, is the worry that they might mix my assignment answers up with someone else, and give me 35% when I did enough work to get 75%. It happened to someone I know. But at least I’m getting the chance to get more educated. I think that’s why I weigh more than I did when I was 18. My brain is just that much more packed with knowledge. Brains are muscles after all, and muscle weighs more than fat! It was one fine day in the supermarket. 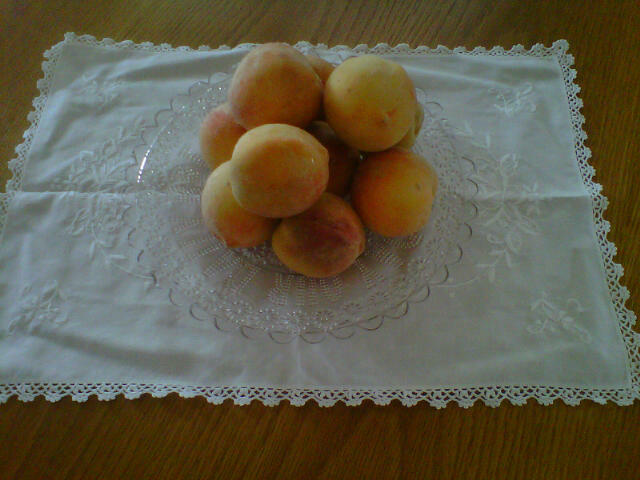 I took great care to choose peaches that did not look bruised. I considered the fact that they had travelled from farm to packing depot to store. I contemplated the care that had been expended to keep them bruise-less. It was well worth the price. I was happy with my selection. I placed them in my basket with respect. I trawled the store for the rest of my listed requirements. Each additional item was placed strategically around my pieces of fruit to avoid the slightest detriment to their health. Upon arrival at the checkout, I held my trophies aloft with my most winning smile. The till operator rewarded me with a cheerful glance, rang the price up, and placed my purchase on the counter with the same care as she did the eggs. The packer had missed our exchange. She packed the first packet with goodies whilst I paid. Then, before I had a chance to stop her, (you guessed it) she dumped her fruity victims into the bottom of the second bag. Shock waves ricocheted through my psyche. I gulped air to calm myself before sputtering out my complaint. To ignore such blatant abuse would be an injustice. The recipient of my complaint had the grace to apologise as did the checkout lady who realised that her colleague had not paid attention. Perhaps these two Customer Servants will remember their lesson and honour the pickers, packers, merchandisers and consumers with every piece of fruit that crosses their counter. I might acquire a reputation for being a ‘grumpy old bag’, but I intend to speak up on every such occasion. Imagine what it could do for our economy, stress levels, facial features and hair colour if each one of us contributed to the education and training of every checkout operator and packer in the country. This morning one of my favourite radio DJs was having a rant about names. One woman phoned in and he said, ‘What were your parents smoking when they named you?’ And she said, ‘I keep asking them that.’ She was not amused by her strange name, claiming that no one knew how to pronounce it or spell it and she was constantly having to correct or explain it to people. Strange is one thing, like Apple, but at least people can spell that. Then there’s that magical chef who has four children their names are, Buddy Bear Maurice, Petal Blossom Rainbow, Daisy Boo Pamela, Poppy Honey Rosie. The girl’s names may all be sweet, and perhaps by the time she’s old enough the world will be ready for a woman president called Petal, but I’m just not sure about a hero named Buddy Bear. I gave this some thought then pondered on the words of their mother, Mrs Oliver, who quite rightly said in an interview, your children’s names are no one else’s busin ess. Having a rather traditional name I longed in my younger days to be someone more exotic. Choosing names for my characters is one of the things I love most about writing and I discovered early on that it’s not that easy. I sometimes go with names I’d have liked for myself, or names of people I admire and some days, when feeling so inspired, I look around me and choose names from things that surround me. Sometimes there are flowers like Petunia and Marigold and sometimes spices like Chai and Herb. When it comes to fruits you have to be careful, but I like Berry and Olive (Is an olive a fruit?). There are plenty of country names to choose from, Kenya and France being only two and of course there are days when you need to have a hero who is proper and Victorian and then Henry or Elizabeth are obvious choices. I considered adding vegetables to the list for inspiring names and although my niece once had a doll named Spinach I don’t know if Butternut or Bean would make anybody happy no matter what they had, or had not, been inhaling. As a Durbanite, I am used to the summer heat of my home town with its excessive humidity levels. For the rest of you poor souls who live in Johannesburg, Cape Town, the UK and other parts far north and south of the tropics, let me explain: That means that you get used to stepping out of a shower, drying yourself off and feeling immediately damp again as the 80-110% humidity levels kick in and saturate your skin as if that towel was a figment of a deluded imagination. After the first few summers in Durban you learn to live with the feeling of wet, clammy skin through the heat of December, January and February. Somehow it’s a small price to pay for the pleasure of mild winters when you don’t need electric blankets and hot water bottles like the rest of the country. A single snug fleece from your favourite camping shop and an attractive scarf or trendy pair of boots are more like a fashion statement than an actual concession to the weather, and you wear them because it’s fun to pretend it’s cold. Aah, Durban – the place to be at any time of the year. Two years ago when I visited Australia for the first time, I was pleasantly surprised to find that I was able to stand the extreme summer temperatures in Melbourne. These temperatures soared way above the 28-29° Celsius that I was used to, up into the mid and high 30s. At first I imagined my energy levels to be a by-product of my eagerness to explore the beautiful city against all odds, but I gradually realised that it was because the humidity was absent. As I stepped away from my bath towel, I stayed dry despite the heat. The lack of water in the Australian air made the heavy mugginess of home seem like a distant memory. With relatively low humidity, I could endure anything. As long as I armed myself with lashings of sunscreen I could soar – like Icarus – close to the Australian sun without fear. For four glorious weeks I flew around Melbourne drinking in the delights of the city, no matter what the weather. I assumed that my second trip to Australia would be no different. And I was right… Until the second week of January 2014. I had arrived in Melbourne on the 9th January, full of the same eagerness to explore my favourite city, ready to face the same dry heat and high temperatures. A few days later, after I had caught up with my jetlag, I stepped outside – armed with sunscreen and loose cotton clothing – into the worst heat-wave Australia has suffered in living memory. At first I thought it was just me. I was two years older and maybe not as fit as I had once been. Gritting my teeth, I steeled my determination and insisted on dragging my sister around in the heat of the day while she muttered things about mad dogs and Englishmen (or the fourth generation descendents thereof) and sang odd little snippets once penned by Noel Coward. We persevered as best we could, determined not to let a little bit of heat get the better of us, but on the day when Adelaide was declared the hottest place on earth since 1908, we had to admit that we might have made a slight mistake. On that same day, when it was still 46.9º C on the veranda at 3 o’clock in the afternoon, we finally admitted defeat and decided to retire indoors where it was a cool 32° instead. After four days of weather that wilted my resolve and melted the glue on my Icarus wings, the temperatures finally dropped to a more manageable 26º on the evening of Friday 17th January.